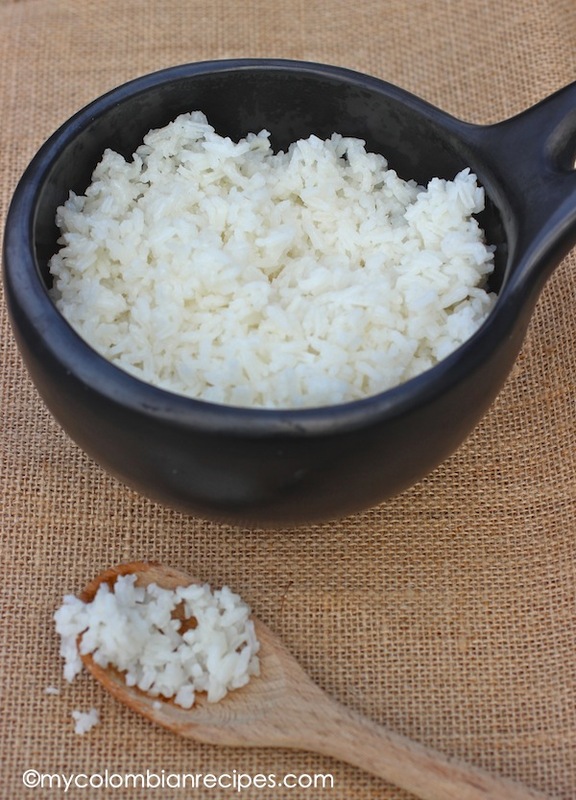 Plain white rice or Arroz Blanco is the perfect accompaniment to any Colombian meal. In my family we would eat white rice as a side dish with everything. For my grandmother, the coffee pot,the rice maker and the pressure cooker were all the kitchen gadgets she needed. She use to get up every morning and make coffee and white rice and keep it in the rice maker warm for the day. 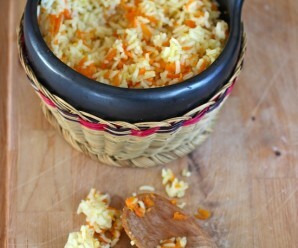 In a medium pot, place the rice and add the water, oil and salt. Bring to a boil for about 30 seconds, reduce the heat to low and cook for about 15 to 20 minutes or until the water is absorbed and the rice is tender. Remove from the heat and let it sit for 5 minutes and serve. 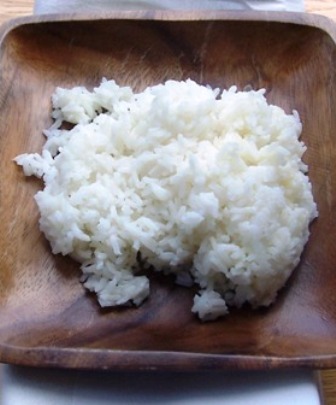 When I just started cooking, it took me a long time to learn how to make a perfect rice. It took quite a few tries to make it just right! Yours look perfect! I think I could live on rice alone. I love the short story about your grandmother. I’ll be trying your rice recipe soon. Carole, I love rice too. First we fry some green onions (un gajo o dos), garlic (un diente) and a pinch of salt for taste. Then after it starts getting brownish we put the rice and fry it for a little bit. We then pour the water, we do as you do on your recipe so 2 cups of rice means 4 of water. When the water starts boiling we put a teaspoon of margarine and a few lemon drops and cover the pot until the rice gets cooked and grows. Then we mix it to make sure that it is soft and dry, and we eat it. It’s absolutely delicious! If you ever have the time to try it, let me know what you think! yes i use 2 cloves of garlic. and always make sure to use enough oil for leftover PEGA!!!!!!!!! =) i never measure. just make sure the water is at the first index finger kuncle ABOVE the rice. Hello Andrea – I’m from bogota colombia also, and I been looking for someone that can help me with recipes from my homeland- I been here in the USA for about 15yrs and I have a family of my own now and I really would like to go back to my roots, as far as the cooking goes… I can use any type of basic recipes… Thank you so much for any help u can give me…. Hi when you say you fry green onions do you put oil and if so how much ? Also when you say you fry the rice do you just put the rice in and fry it or wash it first and how long do you fry the rice for and once you add the water do you cover it or no? ANd for how lot do I leave it ? I love this website, so many yummy reciepes to make! I’m on a quest. Trying to find different white rice reciepes. 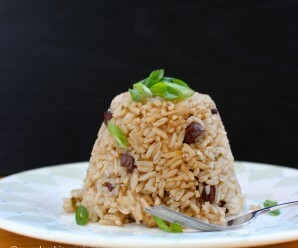 Andrea I saw your version of white rice and I wonder if it’s what my boyfriends mother uses when she makes white rice. She’s from Ecuador and her rice is out of this world good. She claims it’s just rice, oil and salt but it tastes different from any other white rice I’ve ever had. So in stead of spying on her when she cooks I’ll try this. Thanks!! She kicks me out of the kitchen anyhow lol. 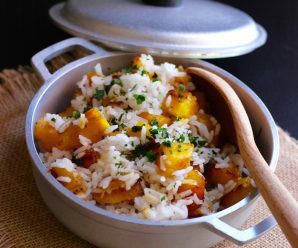 Do you cover the rice as it’s cooking or leave it uncovered? When my Colombian sister-in-law makes rice, she cooks it uncovered for a period of time then covers it at the end. I love her rice but have never been able to duplicate it at home. P.S. I’ve been trying to make Colombian style rice all summer and it is still not coming out right. i bring mine to a boil for like 30 seconds, then cover and turn to low. I make my white rice almost exactly as Erica’s except I use vegetable oil and sprinkle a little bit of onion powder and garlic powder for flavor. The trick is to change the temperature to low after it boils and wait until the foamy starch goes down before covering it. If you cover it right after it boils it will overflow. Cook it on low for about 20 minutes after you cover it or until you see small holes in the rice which means the water has been absorbed. Rice can be difficult to cook at first, the trick is to stick at it and as with everything you will eventually acheive perfection. I make a pretty good pot of rice, but I have never been able to get that perfect Colombian flavor. I’ve tried watching my aunts and abuelita do it, but mine cones out different. Makes me sad. 🙁 I have never used oil, though. Maybe that’s the secret truck I’ve been missing all these years. It’s really interesting how something so straightforward and universal as rice can come out so different for everyone who makes it. We all have our signature Ruybe flavor. I am Iranian-Colombian and would like to make some Colombian rice for my family (my dad is from Medellin). 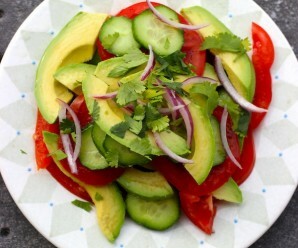 In Iran they use vegetable oil, is it the same for this recipe? or olive oil? Thanks! I like to use vegetable oil or butter. Hi, I’m using rice cooker, can the result be the same? Hola! Not sure I’m seeing the measurements for the recipe correctly. The water states ‘3/12’, but someone in the comments mentions doing it 1:2 (rice:water) like ‘you’. Mind clarifying? Thanks!